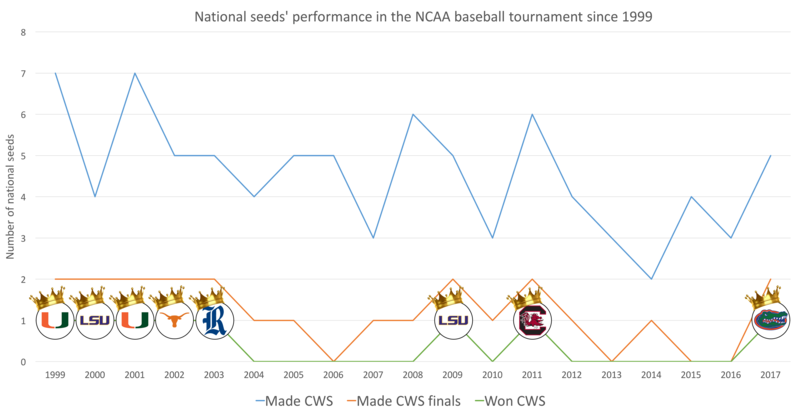 How do national seeds perform in the College World Series? In 2017, Florida became the first national seed to win the championship since South Carolina in 2011. In 1999, 52 years after the first NCAA baseball tournament, a field that started in 1947 with just eight teams and two rounds expanded to 64 teams. And with that expansion came the addition of labeling the eight national seeds. One of those would go on to win the crown — No. 3 Florida. But three fell in their regional matchups, and only five made it to Omaha for the College World Series: Oregon State, Florida, LSU, TCU, and Louisville. They're joined by three unranked squads: Texas A&M, Florida State, and Cal State Fullerton. While certainly eye-raising, this isn’t exactly shocking in one of the most unpredictable sports there is. This year, top-seeded Oregon State was the only one of the 293 Division I baseball teams to have single-digit losses, and they dropped two games in Omaha, failing to make it to the finals. But exactly how common is it for national seeds to lose before Omaha? And, if they do make it to the College World Series, how do they fair? According to the data, 2017's regionals (where North Carolina, Texas Tech, and Stanford bowed out) were nearly twice as upset-happy than usual. Since 1999, national seeds have lost in the regional 21.1 percent of the time. In other words, approximately 1.7 national seeds fall in the opening weekend each year. On average, another 1.8 national seeds (22.4 percent) fail to make it out of the super regionals. That leaves 4.5 national seeds (56.5 percent) making it to Omaha for the eight-team College World Series in a standard year, though we saw five survive this year. Once they get to Omaha, those numbers naturally slim. In the 19-year history of the modern NCAA baseball tournament, 23 national seeds (15.1 percent) have made it to the CWS finals — about 1.2 per tournament. Including Florida in 2017, just eight have ever won the title (5.3 percent), or approximately one every 2.4 years. That number had been trending down quite a bit, though. When the national seeds were first introduced, one of the eight ranked teams won the national championship over another ranked team in five straight years (from 1999-2003). In the 13 years since — before Florida broke the drought in 2017 — only two national seeds have won the title — 3-seed LSU in 2009 and 4-seed South Carolina in 2011. Furthermore, from 1999 to 2006, 65.6 percent of national seeds reached the College World Series. Since then, in the past 10 years, that number shrank to 48.75 percent. In other words, since 2007, less than half of all national seeds even make it to the CWS. This year's total of five national seeds booking trips to Omaha was the highest we've seen since 2011, when six national seeds made the CWS. Before Florida, that was also the last time that a national seed won the championship. That first year of the national seed was actually the only time a No. 1 seed has ever won the tournament, when Miami took home the crown in 1999. In fact, No. 2 seeds have performed better than the No. 1 seed throughout history. Three top seeds have lost in the regional round, compared to just two No. 2 seeds (including North Carolina this year), more No. 2 seeds have made the CWS semifinals (nine to six) as No. 1 seeds, and No. 2 seeds have captured a pair of titles. So, how does all that compare to another popular 64-team tournament? Say, March Madness? For as crazy as March is known to be, the top eight teams in basketball tend to perform much better than their baseball counterparts. But that difference doesn't seem to matter to the Gators. In the past 11 years, Florida is the only school to have won championships in both.